A series diode is often used as a means of protecting equipment from accidental power supply reversal, particularly in battery-powered equipment. Due to forward voltage losses, this is sometimes impractical. One solution is to use an enhancement mode P-channel power Mosfet (Q1) in series with the positive supply rail. A device with low drain-source "on" resistance can be selected to minimise voltage losses, which in turn extends battery life and reduces heat dissipation. Zener diode ZD1 must be included to protect against excessive gate-source voltage, while a 100kΩ resistor limits zener fault current. 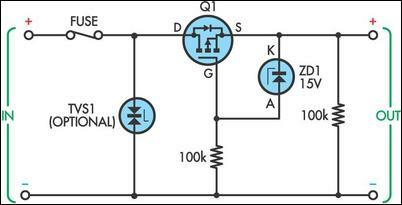 A second 100kΩ resistor across the output ensures that the gate doesn’t float when the input is disconnected. A series fuse and bidirectional transient voltage suppressor (TVS1) could be included to provide over-voltage protection, if desired. If common input & output grounds are unimportant, then a version of this circuit employing an N-channel power Mosfet in series with the negative (0V) rail could also be employed.